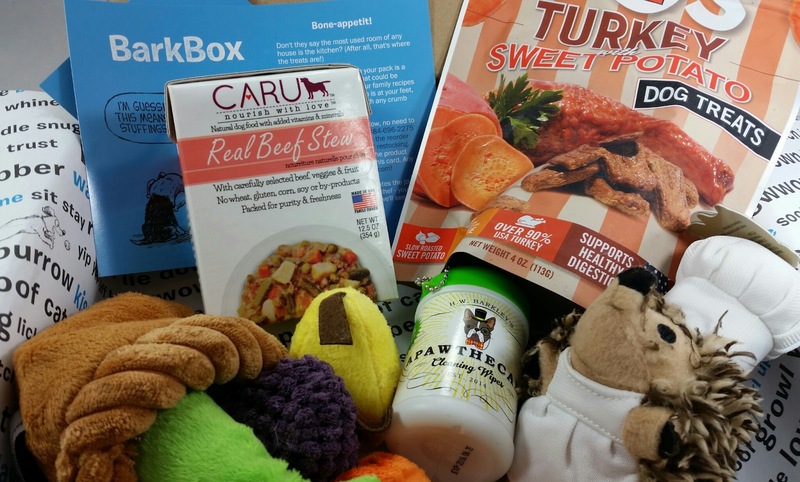 I don't know how Barkbox does it but the November 2014 box is themed so perfectly for Thanksgiving, it's not even funny! And both my dogs went nutty bonkers for what was inside! I can't believe it took me as long as it did to get my dogs a Barkbox and I'm so glad I did. It's so much fun for them (even if it means I have to throw a ball fifty thousand times). The Cost: $29.99/month, less with a longer subscription. Get 10% off with this link! The theme this month is Bone-Appetit and is basically all about Thanksgiving Dinner. Which if you have dogs, you know they love it. All those extra people sneaking tidbits under the table, all those extra things that get knocked onto the floor. Those occasional plates or bowls of snacks that are just within reach... It's dog heaven! 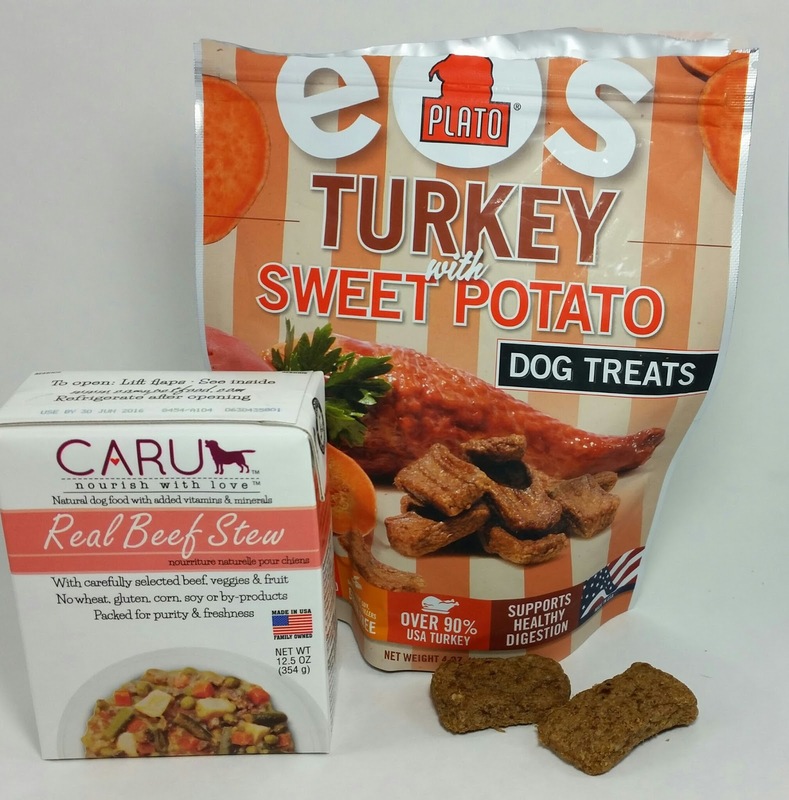 Caru Pet Food Beef Stew- Made in small batches with human grade ingredients with Beef as the main ingredient! Woohoo! The dogs will be spoiled with this one because I don't think theyve ever had anything like it before. Update to add that I fed this to my dogs today. I split it half and half between them. As soon as I cut the box open, they started doing spins which means they are very excited. It's a lot of food and I think it's more than I normally feed them but oh well. I set their bowls down and told them they could eat and I've never seen them inhale food so fast! Bugsy had his entire snout in the stew, I don't know how he could breathe. So, I made them sit. Right in the middle of their dinner. I don't think I've done that before but I don't need them choking on food happiness. Can I tell you how proud I was when they both stepped away from their food and sat?! What good boys! Now I feel like I should give them wet food every once in awhile. They really loved it! Plato EOS Turkey and Sweet Potato Dog Treats- My dogs both *love* sweet potatoes. Their regular dog food contains sweet potatoes, they love it when I add a glop of plain canned sweet potato or yam to their food bown and this all means that they really, really liked these treats. They're sort of bone shaped and are about two inches long. And they smell so good that I want to eat them. Since when does dog food smell better than people food!? These are made with 90% turkey! All natural and from the USA. 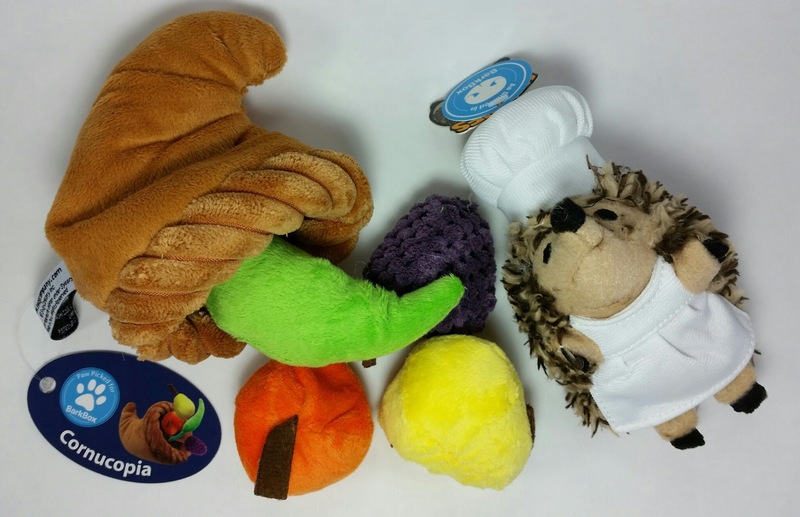 Swag Company Cornucopia for Barkbox- Ah, ha! Barkbox is having toys made to fit their themes!! I've been wondering how they find such perfect toys! This cornucopia has five fruits stuck inside. They ALL have squeakers, too! So you stuff them all into the cornucopia and your dog gets to snuffle them all out. Both my terriers went crazy for this toy. Bugsy has not stopped playing with it since I gave it to him. He has desqueaked two of them but has been running around with the other two stuffed in his mouth and playing by himself with them. You know he's having fun when his ear gets floppy and pink. This is the orange and the grapes. The grapes is basically a ball of dog slobber and I won't touch it. It's okay though because he can entertain himself by kicking one, then the other and chasing them. At least he's occupied! 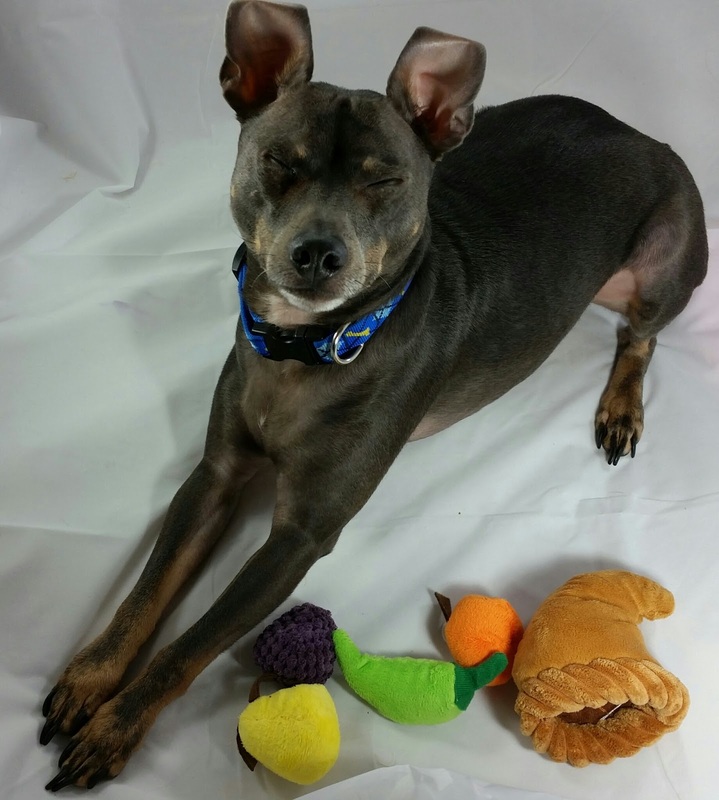 Petmate Chef Heggies- Well, that turkey isn't going to cook itself! So we have a hedgehog chef to help in the kitchen! Another squeaky toy but the boys have been preoccupied with the cornucopia so far. H.W. 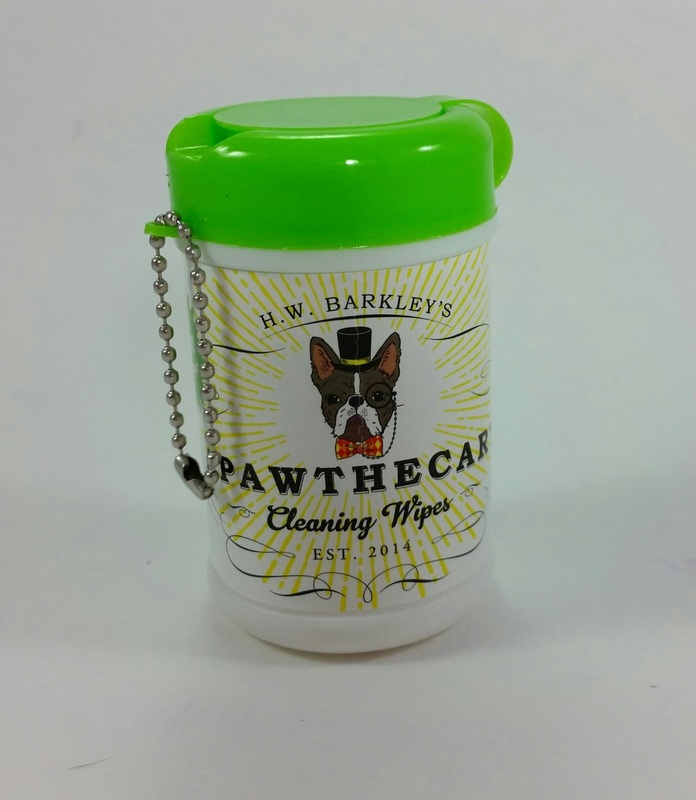 Barkley's Pawthecry Cleaning Wipes- Wash your hands before you eat! And clean your paws when you come inside from the rainy, muddy outside. It's that time of year here! No one likes muddy pawprints on floors that have just been cleaned for company! VERDICT: I love Barkbox more and more with every box. There is always something the boys love, whether it's toys or treats. The variety is spectacular, you'll never see the same thing twice. And if one toy gets destuffed and shredded, well, there's more coming next month! If your dogs are anything like mine, they go through toys pretty fast anyway. Now I no longer have to make special trips just for toys to keep the boys occupied. And they get a revolving door of new and exciting treats! Half these things I've never seen before and have great ingredients and the other half I probably wouldn't even think of buying! I'm pretty vanilla when it comes to toys and treats and some of Bugsy's favorite toys are still around and are from Barkbox. 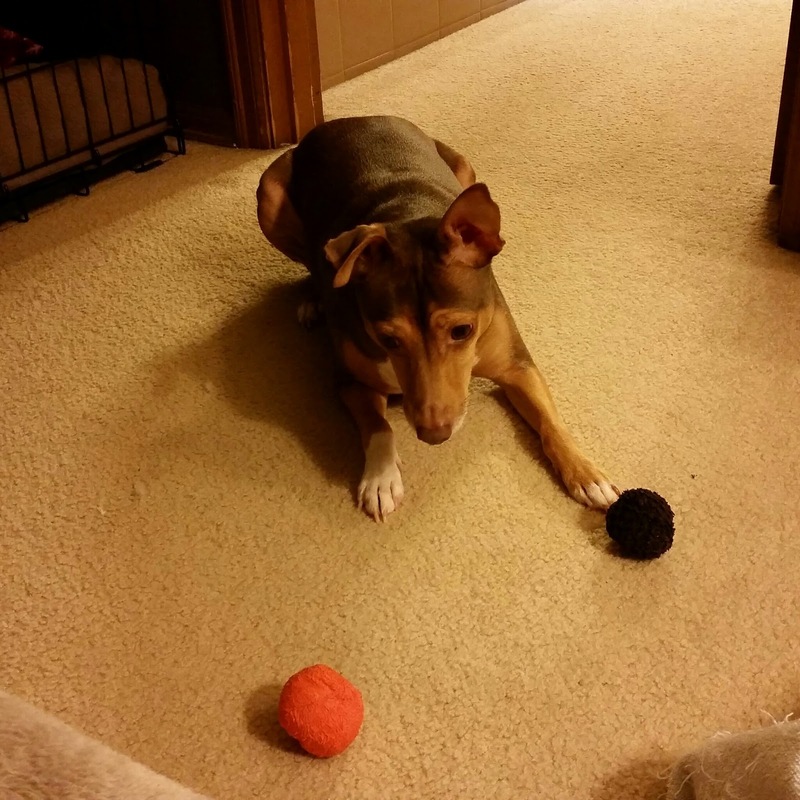 Who knew a toy rubber raspberry would become his favorite ball!? Barkbox, apparently! If you would like to sign up for Barkbox, you can do that right here. Using that link will give you 10% off your subscription, too! Hooray for discounts! Also! If you use Ebates, you will get $4 back on your Barkbox purchase which is also amazing! This is new, they didn't used to be a part of Ebates! If you don't know about Ebates, it's a site that earns you cash rebates for shopping online. I was skeptical but I do a LOT of online shopping and signed up to see if it was for real. Yes. It is. And if you shop online, you should sign up and take advantage of their program! Alright, one last dog photo! This is Squeento bringing his cornucopia for Thanksgiving Dinner. Haha! We call Dexter "Squeeeeento" because he is so squinty all the time. And I managed to get a picture of his squintiness so I had to share it! And, squeeeeee, he's so cute, of course. My little gray rat with the backwards ears and allergies. He's my first dog ever and he's ridiculously spoiled. OH MY DOG this box is adorable! That cornucopia is total win. Barkbox has been sending out the cutest toys lately and I want to keep them all for myself. I hear the beef stew is made of human grade ingredients...I don't know about you but if it smells as good as it looks I would be so tempted to sneak a taste. We got a plush carrot in our box that I'm sure would last <1 min so I took advantage of Scout's Honor and they are soooo responsive! I offered to exchange it for something but they let me keep it and pick something else out, no questions asked. Such awesome customer service! Ooo!! I've been wondering about that Scouts Honor! Nice to know they are so great about it! And seriously, that cornucopia was the cutest thing ever and Bugsy is still playing with it today.